As predicted, Spain’s messy general election resulted in no clear winner, and none of its two largest parties could claim a majority in the lower house of Spain’s parliament. What’s more, though two upstart parties upended the political status quo that’s existed for nearly 40 years in Spain, neither did so well that they can form a government — or even serve as a kingmaker for one of the two established parties. While the conservative Partido Popular (PP, the People’s Party) emerged with the largest share of the vote, prime minister Mariano Rajoy has plenty of reason to despair. Much of the party’s support comes from older voters in the Spanish countryside, and the PP benefited from an electoral system that delivers slightly more seats to parties with support outside Spain’s urban centers. Nevertheless, he has lost his absolute majority, dropped 64 seats and, worst of all for Rajoy, there’s no clear or easy path to a governing majority. Though Spain’s economy has stabilized under the past four years of PP rule, unemployment remains staggeringly high (21.2%). The party’s leader since 2004, Rajoy might ultimately be pushed aside during coalition talks for a younger or more charismatic leader, like deputy prime minister Soraya Sáenz de Santamaría. Meanwhile, the center-left Partido Socialista Obrero Español (PSOE, Spanish Socialist Workers’ Party) suffered its worst defeat since the transition to democracy in the late 1970s. Its new leader, Pedro Sánchez, a moderate economist, simply could not convince voters to look beyond long-simmering corruption scandals (which, by the way, also plague Rajoy’s party) and the record of the prior PSOE government, which took the first steps toward the path of austerity measures in the aftermath of the 2009-10 eurozone debt crisis. Indeed, the PSOE just barely outpolled Podemos, an anti-austerity alternative that burst onto the Spanish political scene in 2014, embracing the anti-establishment protests of the ‘indignados’ movement. Despite leading polls earlier this year, Podemos crashed as fears grew that it would cause the kind of economic pandemonium that plagued Greece after the election of the far-left SYRIZA this year. Its leading spokesperson, Pablo Iglesias, began to moderate his movement’s rhetoric, and rallied to a strong third-place finish. The center-right liberal Ciudadanos (‘C’s,’ Citizens), a federalist, economically liberal party founded in Catalonia in 2007, made the leap from regional politics to national politics, but its leader Albert Rivera must be disappointed that it failed to steal more voters from Rajoy. 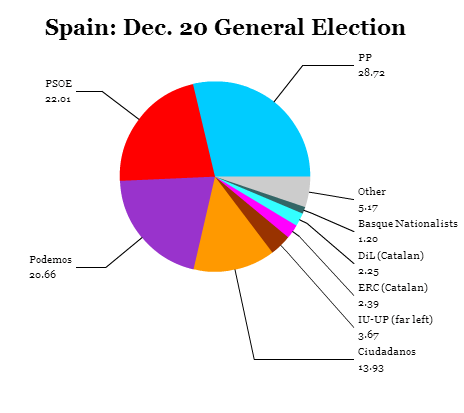 With another handful of seats going to various pro-independence Catalan parties, as well as Basque and Galician regional parties, the net result is that no one has enough seats in the 350-member Congreso de los Diputados (Congress of Deputies), the lower house of Spain’s legislature, the Cortes Generales (General Courts). 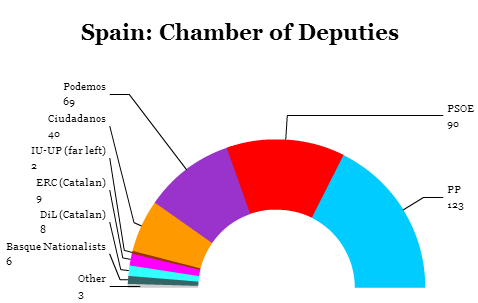 Notably, Rajoy maintained the PP’s majority, however reduced, in the far less powerful upper house, the Senado (Senate), which can be overruled on most matters (i.e., not ‘organic laws’ that deal with constitutional matters, civil rights and federalism) by majority vote of the Chamber of Deputies. Voters elected 208 senators on Sunday as well (an additional 58 senators are appointed by regional assemblies). Two sets of statistics are worth considering. First, the traditional major parties (the PP and PSOE) won just 50.7% of the vote in aggregate, compared to 83.8% in the 2008 election and 73.4% in the 2011 election. Obviously, that means Spain is entering a new era where coalition politics are more important. That’s not entirely unprecedented — when José María Aznar won 156 seats after the 1996 elections, he had to work with Catalan, Basque and Canarian nationalists to form a stable government. But the success of Podemos and Ciudadanos has transformed Spain’s politics from a two-party matter to a multiparty affair. Secondly, among the four major parties to emerge from the 2015 election, it’s staggering just how evenly divided the Spanish left and right are. 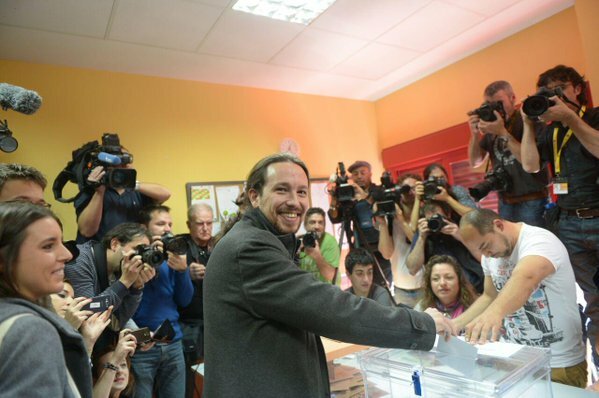 Together, the PP and Ciudadanos won 42.65% of the vote and the PSOE and Podemos won 42.67%. Spain’s electorate, in the broadest sense, delivered neither a mandate to a sharp left turn or a sharp right turn. Greece 2012: deadlocked coalition talks lead to fresh elections. 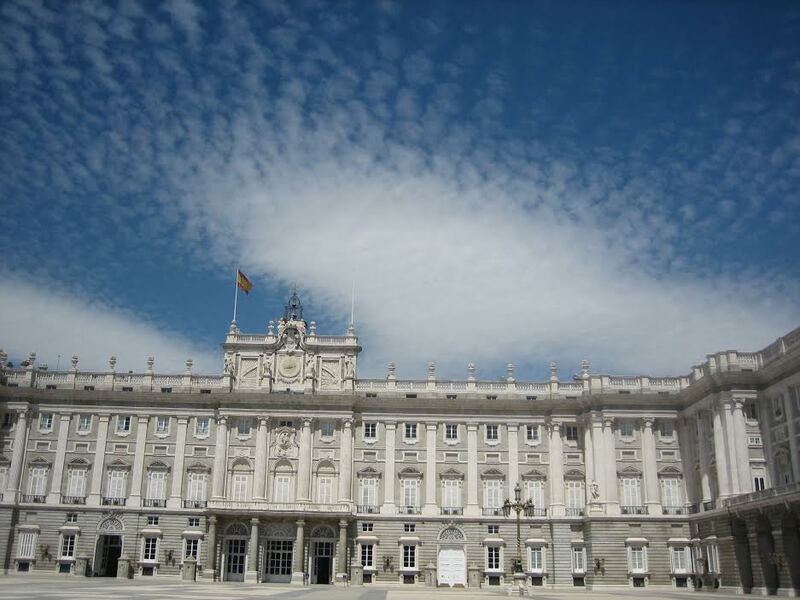 To the extent that Spain is entering a new coalition-based era of its parliamentary politics, a reshaped Spanish political landscape might transcend 20th century fractures and the transition to democracy that’s dominated Spanish political life for a half-century.